Only one kilometre far from the city centre, Giorgino is a very particular historical and geographical reality: the Fishermen’s Village was founded in 1939 under the fascist regime to create housing for local fishermen. So close and yet so far away from the city, its inhabitants continue to keep alive the traditions and the customs of the village. In this sense, Sant’Efisio plays a predominant role for the community of Giorgino: the fishermen are the only ones that lead the martyr to the little church in their village. Here the city and luxurious clothes of the Saint are taken off, to make him wear the more humble ones of the countryside. The costumes worn by the inhabitants of Giogino during the procession are very simple in their workmanship, almost devoid of jewels and symbolize in their colours the strong relationship between those who live in the village and the sea. The Fishermen’s Village is also known for its annual Fish Festival. 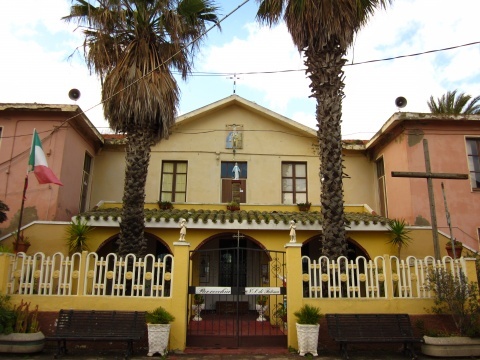 Organised by the Quarter Committee in N. S. di Fatima square, that offers one of the most charming views of the city, the Fish Festival has been taking place for more than 30 years, traditionally on the first weekend of September.